They seem to be a bit early this year (but what blossoms are in full sync with the weird weather we’ve had? ), but clivias are making their show just now. Clivias are show-stoppers when they are in bloom. In gardens, the old standbys are the French and Belgian hybrids derived from Clivia miniata, which have deep orange flowers and broad leaves. The parent species are South African natives with glossy strap-shaped, evergreen leaves that grow from bulbous underground stems and form clumps up to two or three feet across. One sturdy, almost succulent flower stalk emerges from the middle of each plant in late spring. The stem is topped with a starburst of short branches, from 12 to 20, each supporting an orange trumpet-shaped flower. One such stem makes a whole posy all on its own. Decorative, red berries follow from the few flowers that have been pollinated. Most selections have a butter-yellow blotch at the base of the petals, giving them a heart of gold that seems to glow. The latest craze has been to perfect an all-yellow clivia, and premium prices have been paid for the early successes in this attempt. The late California clivia enthusiast Joe Solomone was in the forefront of this movement. He released some lovely pastel orange and salmon clivias, as well as stunning yellow and deep yellow varieties. With advancing time, yellow clivias are coming down in price as their propagation makes them less and less rare. The next Holy Grail is a pure white clivia and the number of lovely pale yellow ones that have resulted in that quest are now also becoming more available. Variegation in leaves is also a sought-after trait. The broad leaves may be striped with white or cream to add further interest. Hybridizers in China and Japan have been leaders in this trend, where, although outdoor temperatures are not conducive to growing clivias year-round, dwarf varieties have become popular houseplants. And, of course, South Africa has a number of dedicated growers who are pushing the color lines along with many excellent varieties. 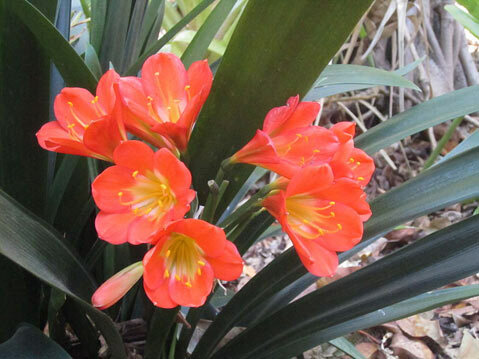 There are a couple of other species of Clivia that are worth looking for and including in the shade garden. C. caulescens has narrow, longer leaves than the relatively stocky C. miniata. The flowers are also narrowly tubular and droop gracefully atop their tall stalks (up to four feet or more). They are pale orange with light green tips and appear in summer. C. nobilis is another species clivia with leaves that are bluntly rounded. Flowers are orange with green edges and may be twice as abundant per stalk. Clivias thrive in partial to full shade and tolerate fairly dry conditions, making them great candidates for those difficult dry shade areas. Unfussy about fertilizers, they actually prefer to be overcrowded and more or less neglected. Plant bulbs about two feet apart, and let them fill in the intervening space. It may take them a few years to reach their full bloom potential. They also grow well in containers and can brighten dark corners on patios and decks. Clivias are not hardy and suffer damage from frost. Site them in protected areas or move containers indoors during cold snaps. Slugs and snails hide among their leaves and crawl up to eat the tender flowers, so be vigilant, and pick them off or use an organic bait formulated from iron phosphate.